Hosted for its fifth year, the Night of Black Excellence set a few landmarks in its history. 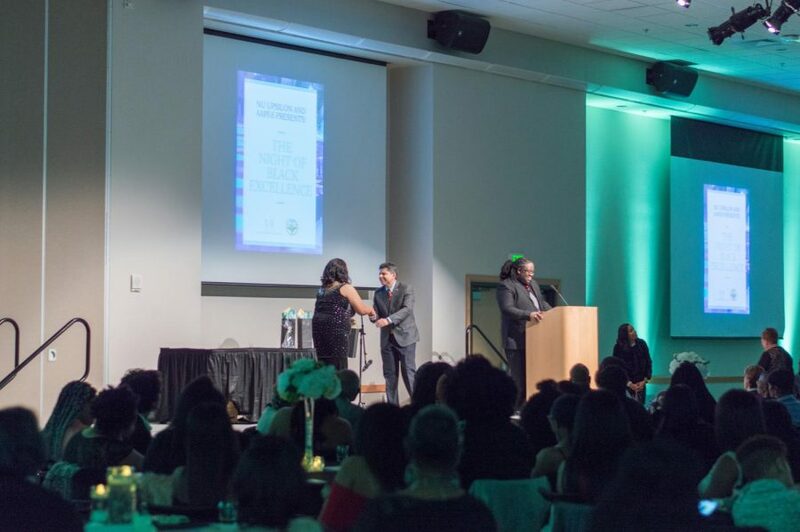 The gala recognized various members of NKU’s African-American community and also invited NKU’s upper leadership who were able to attend for the first time. The first hour of the event took place in the lobby of the Student Union, which acted as a forum for students and faculty to showcase projects that included a range from artwork, to research, to customizing, cleaning and restoring shoes. Nina Stewart began the sit-down part of the event singing, “Lift Every Voice and Sing” as those in attendance stood up to sing along. The night also included a video presentation titled “Excellence at NKU,” recorded and produced by Northerner Sports Editor Sierra Newton, a journalism and electronic media & broadcasting double major and a co-host for the evening. 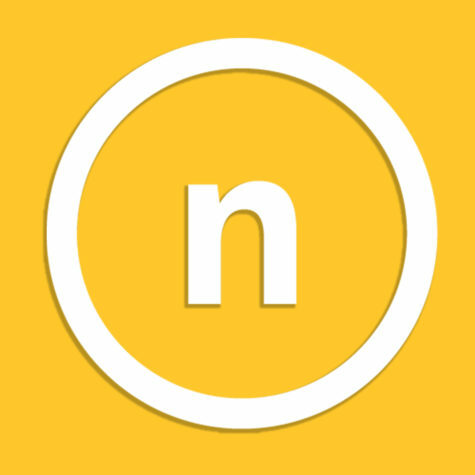 The video showed students and faculty of NKU, defining what excellence means to them. The presentation was followed by NKU President Dr. Ashish Vaidya. For the first time in the event’s history the president, provost, and vice provost of NKU attended, said Sherri Jones advisor of Nu Upsilon Black Women’s Honorary. In previous years, no one represented those positions at this event, according to President of Nu Upsilon Amanda Franklin. “You heard the authentic voices of our students and our faculty and staff in that video talking about what it means to help students succeed and that authenticity is what of course we are building on,” Vaidya said. “We always talk about, ‘Are students college ready?’ We should be having more conversations about, ‘Are we student ready?’ Are we ready to receive and welcome all students of all walks of life? As long as they are willing to work hard and take advantage of the opportunities, NKU should be the place for them,” he said. Following President Vaidya, Alfonzo Vandivier, sophomore music studies major, performed a saxophone solo, which was received with a grand applause and then another applause. “That was so good! Oh my gosh, I can’t believe I have to follow that,” NKU Provost Sue Ott-Rowlands started her speech. Ott-Rowlands said that she could see the NKU community acting as a “launching pad” for student success. She continued speaking about faculty engagement, but gave a charge to the students in attendance. 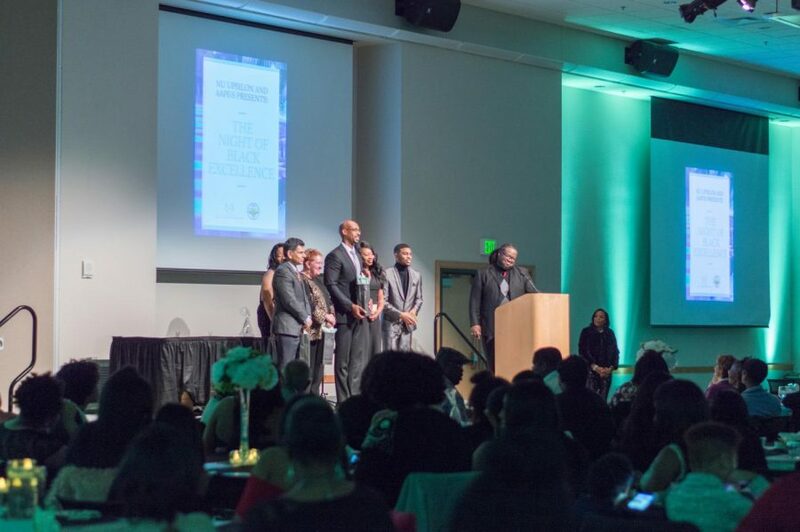 The Night of Black Excellence also has a designated portion of the program called Spotlight on Excellence Awards to present awards in the categories of community, scholarship, service and leadership. Following the awards, Arah Samuels, senior music education major, sang, “I Know Where I’ve Been” from the musical “Hairspray.” Applause roared before she finished the song. After this performance, Vice Provost Dr. Ande Durojaiye spoke on defining black excellence. “The first thing black excellence should be is continuous improvement. Be better tomorrow than you are today. Again, be better tomorrow than you are today. Always strive to achieve your goals and when you achieve the goals in the honor of black excellence reach back and pull somebody else along,” he said. He spoke about how students could “contribute” to their own success. His three “pillars” included: being engaged — socially, academically and with the community. The second pillar was accountability and the third was setting attainable goals. Following Durojaiye, the director of office of African American of Student Initiatives, Carlous Yates presented Unsung Hero Awards. Jones presented the Pillar Awards, which included confidence, elegance, poise, meaning, scholarship and excellence. Jones also presented the Nu Upsilon Advisor Award to Sarai Dean, the director of Night of Black Excellence, who chaired the event. “To me, the night is about showcasing black excellence here on campus. It was our goal to spotlight not only our students but our faculty, our staff, our alumni, our community members, this was something that we have not seen before here at NKU and it was an exciting moment,” Jones said. Finally, President Vaidya, Provost Ott-Rowlands, Vice Provost Durojaiye, Newton and co-host Chandler Blackmond were invited back on stage for the closing remarks and acknowledgments part of the program. “This has been a wonderful night, a lot of great speeches and a lot of great talent,” Yates said.